The cloud puts new demands on your organisation to innovate faster in order to compete effectively. You make decisions every day about how to balance traditional IT responsibilities with cloud innovation. At the same time, your organisation faces increased security threats from outside and within. For these reasons and more, organisations adopt cloud computing at different rates. Security is consistently rated as a top priority for IT organisations. Companies are in the news for security breaches and failing to protect their customer and employee information. The operating system lives and works at a strategic layer in your environment, making it an ideal location to introduce new capabilities for security and control. Windows Server 2016 gives you new capabilities to prevent attacks and detect suspicious activity with features to control privileged access, protect virtual machines and harden the platform against emerging threats. Prevent risks associated with compromised administrative credentials. Use new privileged identity management features to limit access to “just enough” and “just in time” administration. And use Credential Guard to prevent administrative credentials from being stolen by “pass-the-hash” attacks. Protect against unknown vulnerabilities by ensuring only permitted binaries are executed using additional security features, such as Control Flow Guard and Code Integrity. 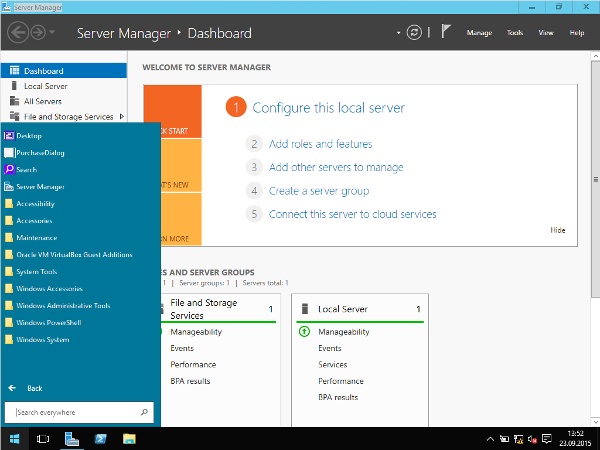 Windows Server 2016 delivers capabilities to help you create a more flexible and cost-efficient data centre using software-defined compute, storage and network virtualisation features inspired by Azure. Run your data centre with a highly automated, resilient, virtualised server operating system. Reduce your data centre footprint, increase availability, and reduce resource usage with “just enough OS” using the Nano Server deployment option, with an image that is 25x smaller than Windows Server 2016 with the full desktop experience. Increase application availability with improved cluster resiliance to transient failures in network and storage. Windows Server 2016 includes expanded capabilities in software-defined storage with an emphasis on resilience, reduced cost and increased control. Create affordable business continuity and disaster recovery among data centres with Storage Replica synchronous storage replication. Windows Server 2016 delivers key networking features used in the Azure data centres to support agility and availability in your data cente. Dynamically segment your network-based on workload needs, using a distributed firewall and network security groups to apply rich policies within and across segments. Layer enforcement by routing traffic to virtualised firewall appliances for even greater levels of security. Take control of your hybrid workloads, including running them in containers, and move them across servers, racks and clouds using standards-based VXLAN and NVGRE overlay networks and multi-tenanted hybrid gateways. Optimise your cost/performance ratio when you converge RDMA and tenant traffic on the same teamed NICs, driving down cost while providing performance at 40G and beyond.